If you have decided to set up your outdoor speaker system in your backyard, patio or garden, the next step is to really figure out how to wire these outdoor speakers to your receiver or audio amplifier. The aim of this guide is to assist you in choosing which outdoor speaker wiring is best for your setup, considering the wattage of the speaker, the length of your garden and the power requirements. Gauge. For outdoor speaker wiring, we would generally recommend wiring between 12 to 14 gauge (or American Wire Gauge, “AWG”). The AWG number determines the thickness of the wire and the lower the gauge number, the thicker the wire. This is why we always recommend going with 12 or 14 gauge wiring because anything less than this thickness may cause your audio quality to suffer. You should also consider the distance between your audio amplifier and the outdoor speakers as the longer the distance, the more degradation in sound quality can occur and you would need a thicker outdoor speaker wire to compensate for the higher impedance. Distance. Our general recommendation is that 14 gauge wiring is good for anything below 100 feet long – this is especially true if you are looking for burial speaker wiring setups where the wire goes underground directly to your speakers. While 16 gauge speaker wiring is fine for speaker setups less than 80 feet from the power source, we would still recommend 14 gauge as it has a higher voltage capacity and less resistance – which means that your outdoor speakers will perform better. For distances above 100 feet, we would recommend going with 12 AWG. This is because 12 AWG wiring is much thicker than 14 AWG and has less resistance when running through longer distances, thereby improving the sound transmission and quality. For very short distances (i.e., distances below 50 feet), 16 AWG wiring would generally be less costly and able to handle the voltage without any issues. CL2 vs CL3. The CL rating determines the voltage and fire resistance of the speaker cable. CL2 wiring indicates that the cable is suitable for in-wall installation for home audio setups and can withstand electrical surges of up to 150 volts. CL3 cables indicates that the cable jacket is able to withstand voltage spikes of up to 300 volts. For outdoor speaker wiring, we would recommend anything from CL2 and above to ensure that the wiring can withstand elements and safely conduct electricity without posing a fire risk to your home. This is particularly important for burial-type outdoor speaker wiring and cabling that goes from your home into outdoor exposed environments. Wire Length. It is generally a good idea to get outdoor speaker wire that is at least 20-30% longer than the intended distance. This is to allow margin for error especially if you are running the wiring through the wall or through underground piping – you would want to cut some slack to the wiring to enable you to move the speakers or re-position your setup if necessary. Additionally, too much strain on the wire may cause sound degradation, so it’s generally a good idea to get longer wires when connecting to your outdoor speaker system. Direct Burial Wire. If you intend to run outdoor speaker wires through the ground, be sure to check that these wires are protected for underground burial as these wires normally will be exposed to water or sunlight, which means that they require extra protection. If you only intend to use outdoor speaker wiring for patio speakers without direct exposure to the elements, then standard CL2 cabling would usually suffice. Be sure to check out our top recommendations below on which outdoor speaker wire to use for your outdoor speaker system setup. These wires are chosen because they are designed with a lower gauge (14 to 12 AWG) for less resistance and much better sound quality. These speaker wires are also shielded from outdoor elements such as sunlight and rain for maximum durability. If you intend to bury the wire underground, we would recommend installing an underground pipe to run the wiring to your outdoor speakers as this would generally improve the durability and usage of the wire. It is generally not a good idea to let your wire be constantly exposed to water as this may pose electrical issues in the long-term. If you are looking for a simple but reliable outdoor speaker wire, the MediaBridge 14AWG outdoor speaker wire is definitely the one you should consider. 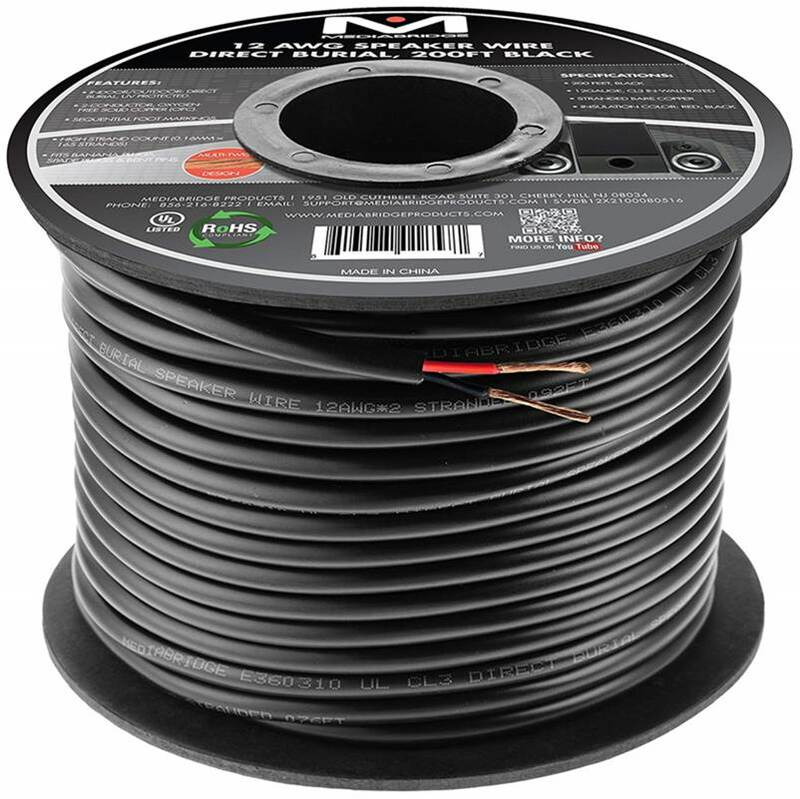 These are 14 gauge wires which are suitable for speaker distances around 100 feet or more, and are ideal for connecting your AV receiver or amplifier to your outdoor speakers. 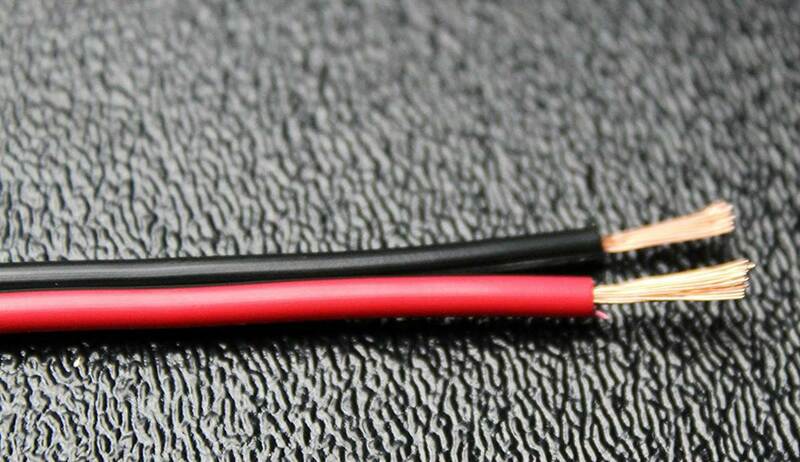 These are 2-conduct speaker wires and come with both the red and black terminals clearly demarcated for easy reference – you can pair these wires with banana plugs, spade tips or bent pin connectors for custom sound installations. The wires are double insulated and covered by a white coat jacket which provides added durability – the wires are tough and flexible which makes manoeuvring them around corners an easy task. It is also marked at 3 feet intervals for easy installation. The wires are CL2 rated for in-wall use and are suitable for in-home or commercial speaker installations. Do note that because the wires are rated CL2, you would need extra protection for these wires if you choose to expose them under outdoor elements, such as a conduit pipe. These 14 AWG wires are best suited for decks and patio installations due to their CL2 rating, which makes them suitable for in-wall use. We would not recommend directly exposing these wires under sunlight or rain – it would be best to run them through a conduit pipe to your speakers for added security. We liked the fact that the wires are marked at 3 feet intervals which helps you measure the distance from the amplifier to your receiver. The wire itself is a high-strand copper wire with 105 x 0.16mm strands which provides excellent sound transmission – the wire is 14 AWG which makes it suitable for distances around 100 feet for cusom installations. It also has color coding to distinguish between polarities. The white jacket is tough and flexible and really protects the inner wiring really well. On the whole, these outdoor speaker wires are easy to cut and install and come with good protection for long lasting durability. The Verdict? The MediaBridge 14AWG wires are really good quality wires for outdoor speaker installations on decks and patios. They are CL2 rated wires which means that they can be used for in-wall home or commercial applications, although they should not be directly exposed under outdoor weather conditions – we would recommend running them through a conduit pipe for protection. The audio quality that we got from these cables was superb and fuss-free – essentially you get excellent sound performance with no voltage issues or distortion at high volume levels. We also liked the fact that the speaker wiring is clearly marked at the 3 feet interval for easy measurement and setup. The wires are 14 AWG which means that they are suitable for distances around 100 feet from the audio amplifier. The white jacket coating also makes the installation look really clean and is flexible enough to manoeuvre around sharp corners. The wires are also color coded for the speaker terminals which helps make the installation process smooth. 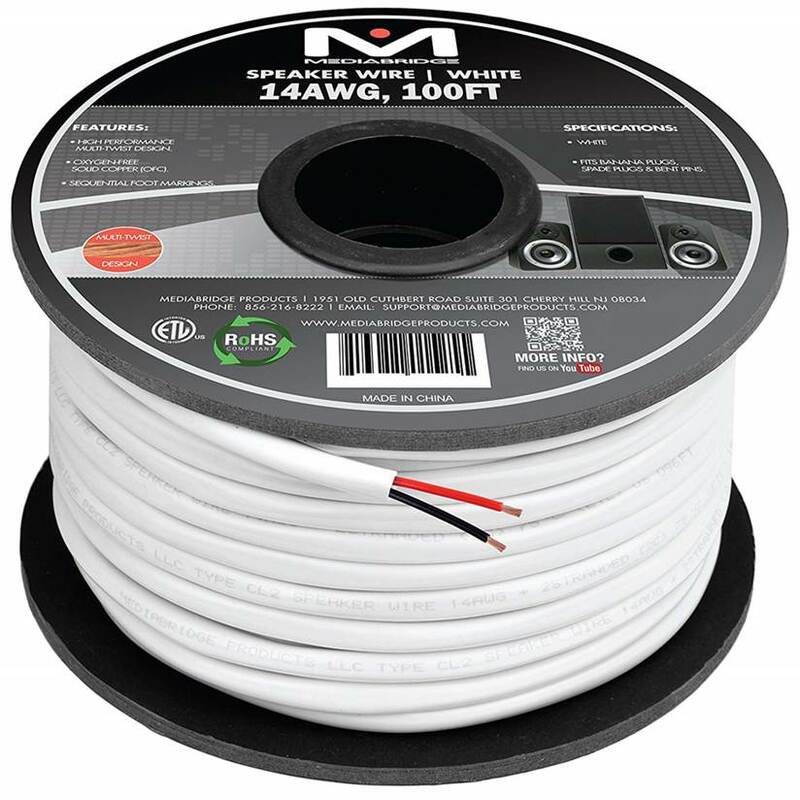 Overall, the MediaBridge 14 AWG CL2 wires are great for in-home patio or deck installations for your outdoor speakers and we highly recommend them. The OSD 12 AWG CL3 outdoor speaker wire is a really tough outdoor wire designed for direct burial and exposure to sunlight. These wires are UL/CL3 rated for direct burial installations and can be run underground through a conduit directly to your outdoor speakers. They are also safe for in-wall installation and are designed to comply with safety standards for residential or commercial use. We would recommend burying these wires 4 to 6” underground to prevent someone from tripping over them. The wire is CL3 outdoor rated which means that it can withstand outdoor elements such as rain or sunlight for long-periods of time. It incorporates double insulation which provides a good layer of protection against voltage leaks and erosion. The cabling also uses a white polyethylene jacket that is inert and U/V resistant for exposure to sunlight, although we would recommend avoiding direct exposure to preserve the durability of these outdoor wires. The OSD 12 AWG wires are great especially if your wire runs exceed 100 feet or more. This is because it has a lower gauge and prevents lost in sound quality by reducing resistance over longer distances. You would be able to use a single 12 AWG strand for up to 300 feet and not have to worry about sound degradation. The entire wire is covered with a UV resistant jacket that is made with polypropylene and provides resistance to UV rays and sunlight. When we tested the OSD wires outdoors, they worked really well and we did not hear any sound degradation from our outdoor speakers or any distortion while cranking up the volume to maximum levels. The distance of our setup was approximately 100 feet in the backyard from the audio receiver. 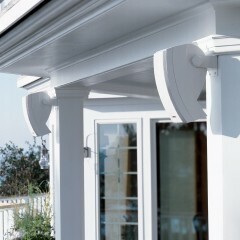 The wires look really durable and the exterior cover feels as though it can withstand harsh outdoor elements. That being said, because the wires are 12 AWG they are pretty thick and chunky – this is a factor to take into consideration when pushing in connectors into the amplifier as the wires are pretty thick. They can also be used for in-wall applications safely without any issues without any hissing noises. The quality of the sound transmitted through these wires is excellent. The Verdict? The OSD 12AWG wires are some of the best outdoor wires (12 gauge 2 conductor wire) you can find for high-end outdoor speaker system setups with a range of 100 feet or more from the audio receiver or amplifier. These wires come with a full weatherproof design with double insulated for better protection. It has a maximum voltage rating of 300V and is also resistant to solvent chemicals and UV rays from the sun. The wires are capable of being buried directly underground and we would recommend burying these wires at least 4-6” underground to avoid any accidents or tripping. The wires are also available in rolls of 50 feet, 100 feet, 250 feet or 500 feet depending on how much wiring you need for your outdoor speaker system setup. If you are looking for a no-frills speaker wire to get the job done, the OSD 12AWG comes highly recommended. The RiteAV 14/2 AWG direct burial outdoor speaker wires are highly quality wires that are suitable for outdoor speaker setups and exposure to outdoor elements. These wires are doubly insulated for protection and also have red and black terminal colorations for easy setup. The wires use oxygen-free copper for smooth sound transmission with 105 strands to lessen the resistance outdoors. The wire is 14/2 AWG which means that it can be used for most outdoor speaker applications up to 100 feet. They are also capable of direct burial and can be buried underground through your backyard or garden. We would generally recommend burying these cables 4-6” underground to prevent anyone from tripping over them. These are really high quality wires and when we tested them, they delivered superb sound quality without any hissing noises or static interruptions. Connecting these wires to the receiver is relatively straightforward although the only downside is that the black jacket is very tough, which means that it takes a lot of effort to cut them. We were very pleased with the durability of these wires – the black jacket cover looks really stiff and durable and able to withstand the tests of time. They are also UV resistant which means that it can survive being exposed to direct sunlight and rain, although we would not recommend direct exposure – ideally you would want to run these cables through an underground conduit in your garden for best protection. They are really decent outdoor speaker wires that get the job done with great sound transmission. The Verdict? If you are looking for a no-frills outdoor speaker wire that works well up to 100 feet, the RiteAV 14/2 AWG speaker wires are definitely the ones you should get. These wires are very well constructed and durable, and come with a black coated jacket that is UV resistant and also resistant to water and rain. The wires are made of oxygen-free copper for seamless transmission and consist of 105 strands to reduce the overall resistance. They are specially designed for direct burial applications and can be buried underneath the grass or sand while connecting to outdoor speakers from your audio receiver. The outdoor speaker wiring is available in chunks of 50 feet, 100 feet, 150 feet, 200 feet, 250 feet and 300 feet which makes it easy to customize according to your home setup. Overall, the RiteAV 14/2 AWG speaker wire represents very good value for money and we highly recommend them. The JSC 14 AWG outdoor speaker wire is another trusty outdoor-grade wire that you can use for your outdoor speaker setup. This wire is reinforced and specially made for outdoor use underground or above ground. It is a high quality wire that contains 41 strains with pure oxygen-free copper conductors for high quality audio transmission. It also has a higher strand count that traditional speaker wiring for less resistance and better signal transfer and flexibility. The wire comes with a black outer jacket that covers the black and red wire terminals – the wire is doubly insulated for extra resistance to the outdoor elements. For best practices, we would recommend running the JSC wires at least 4-6” underground to prevent accidental tripping over the wiring. The wire can also be run underground through a conduit for better protection if required, and is a pretty versatile wiring that can be used for outdoor speakers with a distance between 100 to 120 feet. The JSC 14 AWG wires work like a charm and really deliver clear sound performance without any hissing noises or degradation in sound quality. The sound transmission on these wires is smooth and uninterrupted, and we could also really crank up our outdoor speakers through the receiver without any distortion from the wires. The wiring is well-shielded and protected from outdoor elements and can withstand rain and UV sunlight, although we would recommend burying it underground to avoid direct exposure to the outdoor elements. Setting up the outdoor speakers with this wiring is relatively simple and straightforward with the black and red terminates clearly demarcated. However, do note that because the black outer jacket is relatively thick, you may require extra heavy-duty equipment to cut these wires. They are really good for use as underground speaker cables and work well as direct burial wires. The Verdict? The JSC 14 AWG outdoor speaker wires are a great choice if you are looking for 14 gauge wiring for your outdoor speaker setup. These wires are ideal for a distance between 100 feet to 120 feet and deliver crystal clear sound quality with very little resistance very long distances. These wires are built to be extremely durable and come with a black jacket layer that resists water, sunlight and other solvents. They can be used for direct burial or run through a conduit pipe for better protection. These wires are available at 100 feet per stack which is really good for medium-range setups and it provides you with some flexibility if you decide to re-position the speakers in the future. The only downside to the JSC 14 AWG wires is that they are thick and relatively difficult to cut through, and may require more time to cut and set up the connectors. That being said, the wires are really well-insulated and the black and red terminals are also displayed clearly which helps to save time. Overall, these are really versatile 100 feet outdoor speaker wires that come highly recommended. 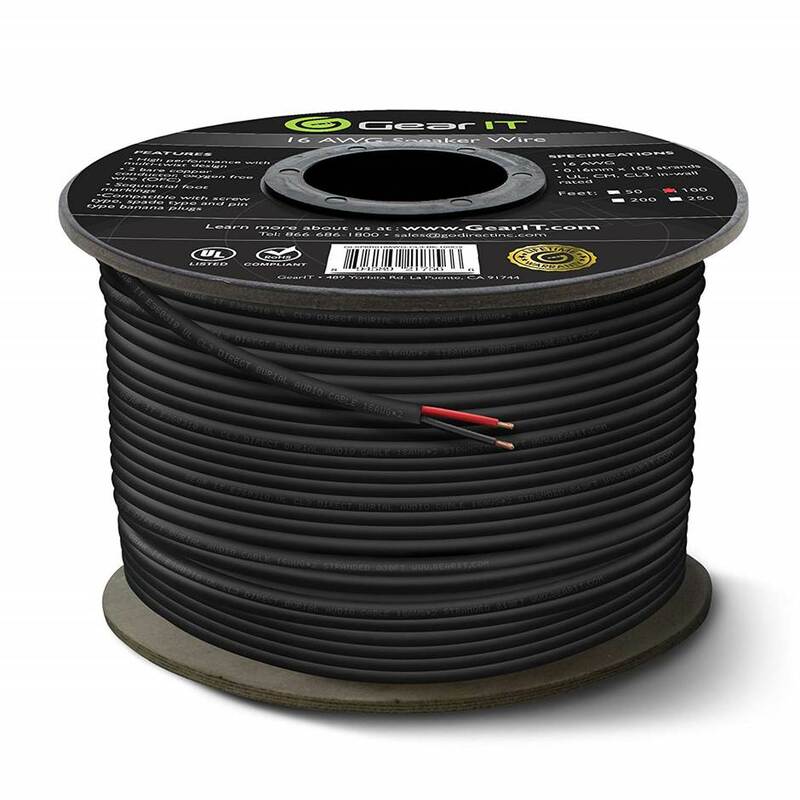 The GearIT 16 AWG outdoor speaker wire is a really versatile and durable wire that can be used for multiple outdoor speakers wiring application. The GearIT Pro features oxygen-free copper speaker wires built with high-stranded conductors which provide really crisp sound quality transmission without any degradation in sound quality over long distances. The is UL CL3 rated which means that you get the highest safety standards with these wires for in-wall installations and can also be paired with banana plugs, spade tips or bent pin connections to connect seamlessly with your AV receiver or amplifier. The OFC wire provides better conductivity to the amplifier over 100 feet long and reduces any electrical resistance which you may encounter with long-distance wiring. The OFC speaker wire is also designed to provide a much higher corrosion resistance and improved heat absorption over time, thereby increasing its durability. The speaker wire is 16 AWG and has 0.16mm x 65 strands within each wire with black and red terminal color coding. We liked the fact that the GearIT 16 AWG wires are wrapped around a spool that allows for easy measuring, cutting and storing. It comes with a tough and flexible insulated black jacket around the wire which provides double insolation and protection from the outdoor elements including rain and UV sunlight. The cable also comes with sequential markings printed directly on the jacket at 2 feet intervals which provides accurate measurement for outdoor speaker positioning. Compared with other outdoor speaker wiring, we found that the GearIT wires have much more copper and thickness for lesser electrical resistance. The outer round jacket is also much easier to work with and cut, allowing you to connect it to banana plugs for wiring to sound amplifiers and receivers. The wire is CL3 rated which means that it can also be used for in-wall installations as well as direct burial and is UL rated and certified. We would recommend burying the cable at least 6” underground to avoid direct exposure to sunlight and to prevent tripping. The Verdict? If you need outdoor speaker wire for distances up to 100 feet for your outdoor speaker system setup, the GearIT 16 AWG wires come highly recommended. While these wires may be costly, they provide really good quality and very good sound transmission over extended lengths. The cable is also very flexible and easy to use and hook up; the wire itself is fine stranded with up to 65 strands per wire which provides better sound transmission and less resistance. We liked the fact that there are markings printed at 2 feet interval which allows you to gauge the distance for the wiring and provides handy measurement. The wiring has a really strong and durable black jacket which wraps around the wire, providing ultraviolet light resistance and water resistance. The OFC wires provide increased conductivity to carry more current from your amplifier and are CL3 rated for custom installation. The GearIT cables are made of high quality materials and this is reflected in the manufacturing and durability of the wiring – if you are looking for high performance 16 AWG wires for your outdoor speaker setup, the GearIT Pro wires are your best bet. The Cables Direct 14 AWG outdoor speaker wires are really good quality speaker wires suited for a wide variety of outdoor speaker wiring applications. These are 14 AWG wires which means they are suited for 100 feet to 150 feet wiring distances. These are copper clad aluminium (CCA) wiring which offers the same frequency and reliability in terms of corrosion resistance to copper wiring. The advantage of CCA is that it is much lighter and more flexible than copper wire and provides equally good sound transmission over long distances. The wire is covered by a black jacket with a rubberized exterior for resistance to UV light and water. It is designed to be buried underground and can also be pulled through a conduit pipe for better protection – they are suitable for outdoor speakers as well as patio speakers and carry the signal from your receiver without any hissing noise or static interference. If you wish to bury these wires underground, we would recommend a depth of approximately 6” underground for better protection. We like the fact that the Cables Direct 14 AWG wires are made of CCA and consist of 99 strands (at 0.16mm) which provide exceptional sound transmission and performance – the density of the strands is very high for 14 AWG wiring and provides really good sound transmission over long distances. They are suitable for commercial or home applications including professional audio wiring especially in outdoor open environments. Installing this speaker wiring to our receiver and amplifier was relatively simple – the casing jacket around the wire is tough to cut through which shows how durable these wires are. You can also connect them to banana plugs for connection with your audio amplifier. Do note that because there are 99 strands within the wire, you would need to be extra careful while cutting the wire as it may rip of easily without a clean cut. The double is double insulated and marked with a stripe on one side for polarity. The red and black terminals are also clearly color marked which makes installation pretty convenient. The wires are also quite tough but flexible enough to manoeuvre around corners, although this may take some effort due to the 14 gauge thickness. The Verdict? The Cables Direct 14 AWG outdoor speaker wires are pretty good 14 gauge wiring for your outdoor speaker setup that delivers really clean and hiss-free sound performance. The wires are made from copper clad aluminium which offers good frequency and reliable sound transmission, as well as corrosion resistance. 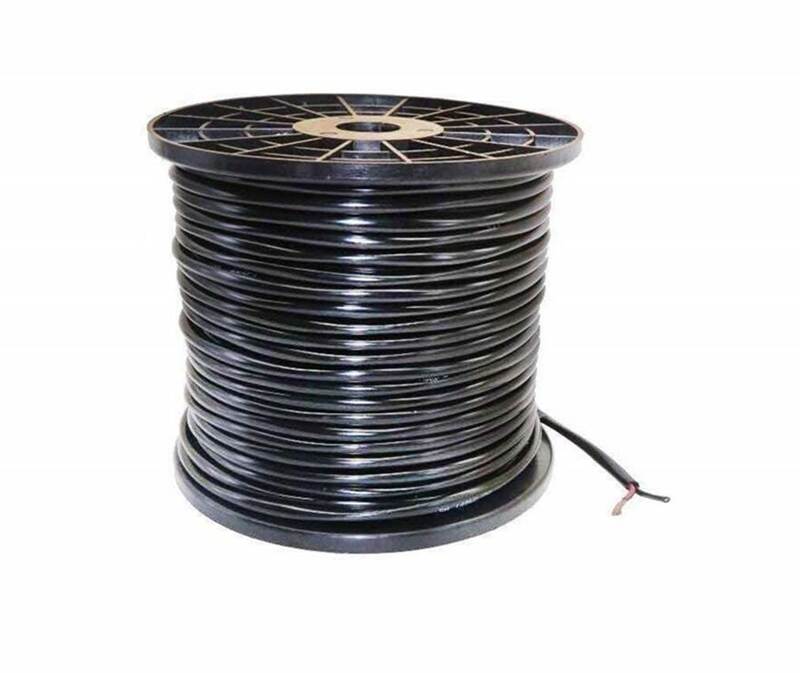 The speaker wire is designed for direct burial which means that you can bury these wires underground to connect to your backyard or lawn speakers. They are tough but flexible cables which allow you to wire them around sharp corners or bends. It comes with a black insulated jacket with a marked stripe on one side for polarity as well as feet count marker for measurement. The internal wire consists of 99 strands with 0.16mm conductors which provide really smooth signal transmission – we were able to crank up the volume on our outdoor speakers close to maximum without experience any distortion. These outdoor speaker wires are suitable for outdoor home or professional sound use and we highly recommend them. The Theatre Solutions CL3 outdoor speaker wire is a really good 16 gauge CL3 wire with a length of 100 feet, and is suitable for direct burial or installation in-wall or for in-ceiling outdoor speakers. The wire is burial grade for use with outdoor speakers and is covered with a UV resistant coat. The wire gauge is 16 AWG which means that it is suitable for outdoor speaker applications up to 100 feet. It delivers consistent and stable sound transmission and each wire has 65 strands with SRPVC flexible insulation, with 2 conductor wires for each speaker. The wiring is oxygen-free copper wire which provides less electrical resistance over long distances, and is ETL certified and ROHS complaint as well. The Theatre Solutions CL3 wire works well for outdoor speaker system setups, including in-wall or in-ceiling applications or for patios and decks. If you are looking for an outdoor speaker wire that can deliver consistent sound quality with good value, the Theatre Solutions CL3 outdoor speaker wire comes highly recommended. When we tested the Theatre Solutions CL3 wire with our outdoor polk audio speakers, we got very clear and pristine sound quality with distances up to 100 feet from the audio amplifier. Installing these wires was pretty straightforward and we liked the fact that the cable jack is marked at every foot which allows you to gauge the distance from the amplifier to the outdoor speakers. The wires are made of real oxygen-free copper which provides really smooth electrical transmission. We also liked the fact that the wire comes with a white jacket coating which protects it against sunlight and is water resistant and suitable for direct burial. The wiring can also be put through an underground conduit pipe for better protection and it is flexible enough to manoeuvre around corners. They look really durable and can last for a long time in outdoor environments, although we do not recommend direct exposure to the elements. 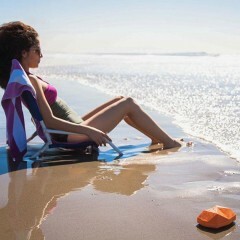 They are really good for patio and deck speaker installations and suitable for use with Class 2 and 3 circuits. The Verdict? 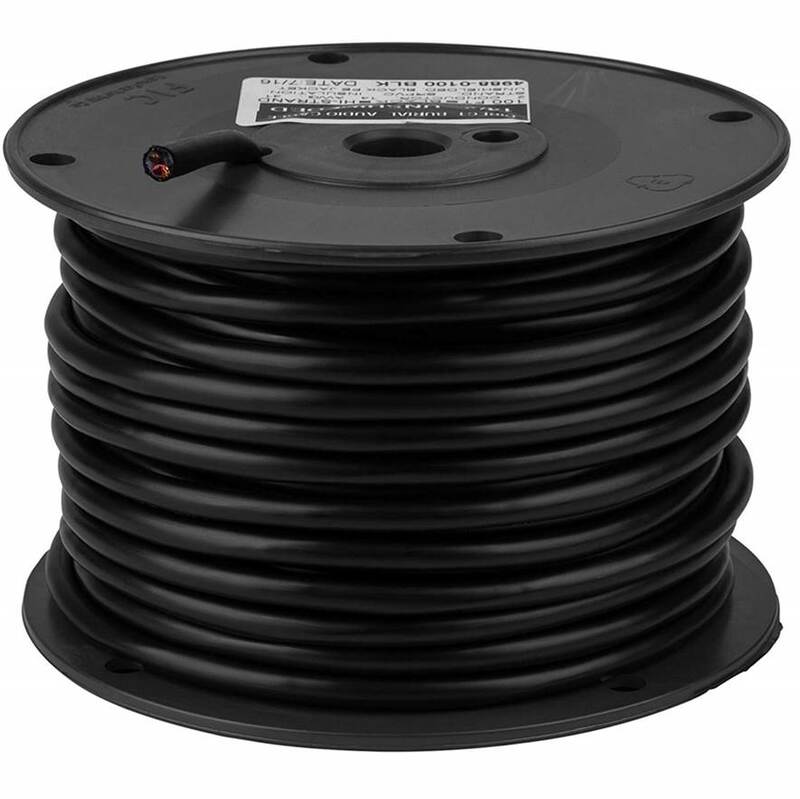 The Theater Solutions CL3 wires are really high quality wires that can be used for outdoor speaker installations up to 100 feet – it comes in rolls of 100 feet length with markers at every foot for easy measurement. The wire is a 16 gauge wire with 65 strands of OFC copper which provide really smooth sound transmission with less resistance. It also has SRPVC ultra-flexible insulation and is rated at CL3 which means that it is suitable for both direct burial as well as in-wall speaker installations. The white jacket that comes with the wire is sunlight resistant and made of burial grade material for prolonged resistance to heat and other outdoor elements. It is also ROHS complaint and ETL certified which is a good added plus. They are suitable for both outdoor home or commercial wiring applications and does the job of transmitting sound signals clearly without any hissing noise or distortion. If you are looking for a fuss-free outdoor speaker wire, the Theatre Solutions CL3 wires are a great choice. The MediaBridge 12AWG is one of the best outdoor speaker wire that we have tested that really delivers great sound performance with minimal distortion and resistance. 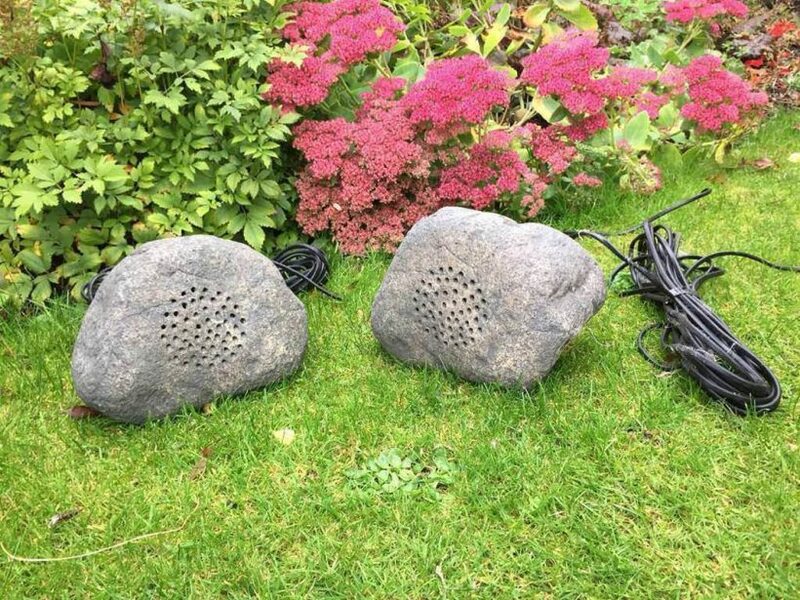 The great thing about these outdoor speaker wires that they are built for underground use and can be buried underneath the garden while being wired to your outdoor speakers. They are suitable for ground use or within a conduit pipe which helps to provide better protection. While the wire is suitable for ground use, we would recommend running them through a conduit for better protection as long term exposure to sunlight and water may cause corrosion of the wiring. The MediaBridge outdoor speaker wiring is double insulated (the red and black OFC terminals are insulated) and covered by a thick layer of rubber for more protection. The MediaBridge wires come with a tough and flexible insulated jacket and are marked at 2 feet internals for easy installation – this is really useful when marking out the distance in your garden lawn. The jacket is also UV protected which makes it resistant to sunlight as well as other outdoor elements. The wire has a CL3 rating which permits in-wall installation in your home with adequate protection. The polarity terminals are also marked with red and black respectively to easily set up and connect the wire to the speakers. The wires are made from high-strand oxygen-free copper (OFC) with 99% oxygen-free bare copper for less resistance and improved connectivity. These wires are suitable for connection to your speakers with you receiver or amplifier, and can also be paired with banana plugs, spade tips or bent pin connectors. They are great for custom installations and are highly versatile for different outdoor speaker system applications. The Verdict? The MediaBridge 12AWG OFC outdoor speaker wires are reliable, safe and very easy to setup. These 12AWG wires are suitable for those who need to run cabling beyond 100 feet to the outdoor speaker system from the indoor receiver without any degradation in sound quality. We did not experience any noticeable dips in sound quality when we connected our outdoor patio speakers to the receive with these wiring – there was also no static interference or white noise which is great. The cabling is relatively easy to work with and comes in a stack of up to 200 feet of wiring with black and red cable terminals. If you are looking for a no-frills heavy duty wire that can survive outdoor elements and can also be buried underground for several years, the MediaBridge outdoor speaker wires come highly recommended. 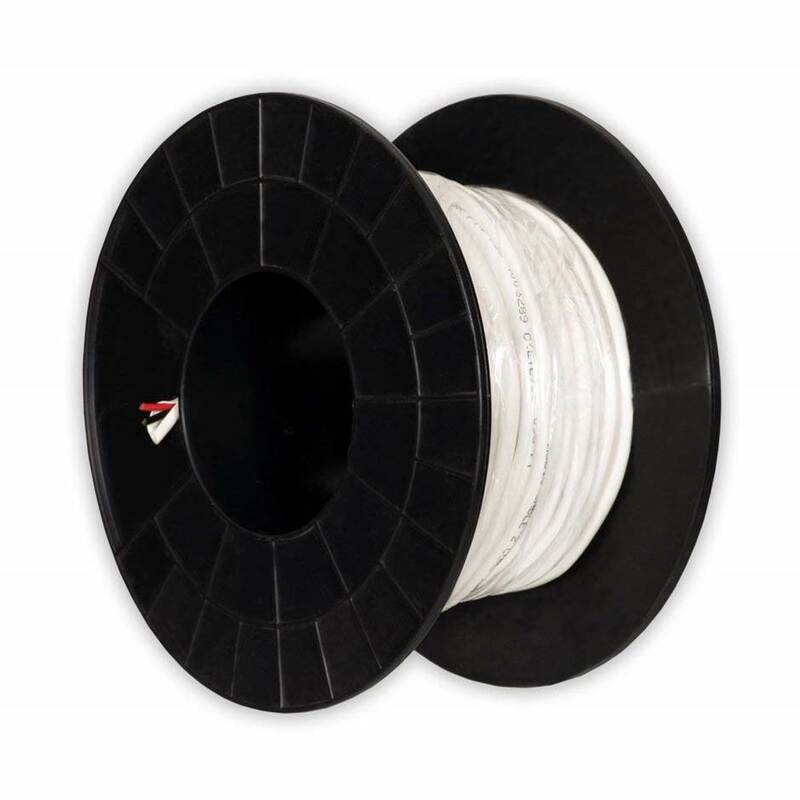 The Cable Matters 14 AWG outdoor speaker wire is a really good quality wire suitable for connecting outdoor speakers to your amplifier or receiver for patios and decks. The wires are CL2 rated which means that they can be used as in-wall wires and are well-protected against voltage shocks. That being said, do note that these wires are not burial grade and if you choose to run them around your garden, you would need to run them through a conduit pipe for extra protection. The wires feature heavy gauge conductors and are made of oxygen-free copper for corrosion resistance and deliver really pristine sound quality. 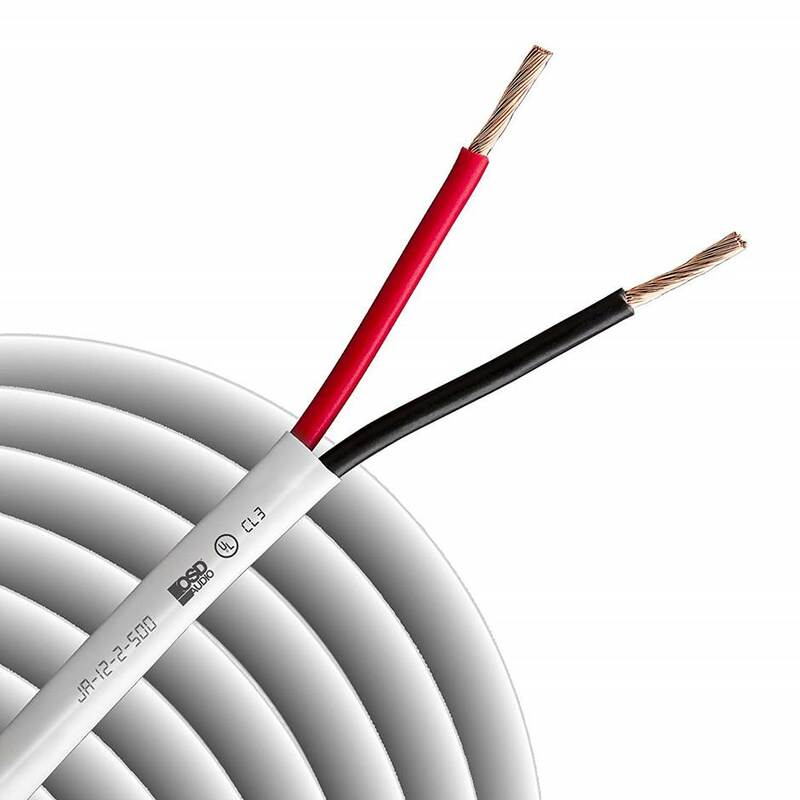 The speaker cable comes with a PVC white jacket that complies with the CL2 rating for fire safety requirements. The two conductors are also jacketed with color-coded PVC for easy polarity identification. It also comes with a plastic spool in the box for easy and convenient installation without tangling up the wires. The quality of the Cable Matters 14 AWG wires is really good – we tested these cables with our outdoor patio speakers and they worked perfectly well without any hissing noises. The wires are 14 gauge which makes them suitable for distances of around 100 feet long from the speaker to the amplifier. The wires are also suitable for in-wall or in-ceiling home theater applications with their CL2 rating. The wires are double insulated and the two conductors are individually insulated with an outer jacket that protects the internal wiring from exposure to outdoor elements; the jacket is stripped easily from the cables which makes it easy to install banana plugs or connectors without damaging the copper wires. The cable jacket is rather flexible which makes it a breeze to install around corners in the floor. We also liked the fact that the wires come with reverse foot marking and are labelled at 1-foot intervals for easy measurement. The wire is also made of oxygen-free copper strands which provide seamless audio transmission without any degradation in sound quality. The Verdict? 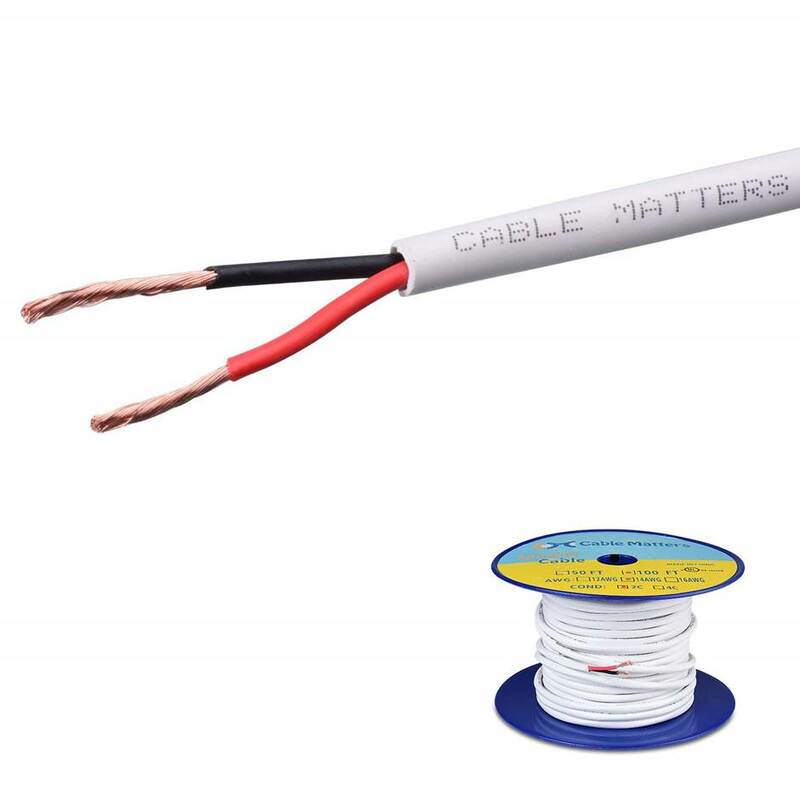 The Cable Matters 14 AWG CL2 outdoor speaker wires are heavy duty wires that deliver really good value. They are great for patio and deck outdoor speaker applications, although they should not be directly buried underground – we would recommend running them through a conduit pipe for better protection. We liked the fact that the cables are labelled at 1-foot intervals for easy measurement and the housing jacket is easy to cut for easy installation with a banana plug or spades. The wire comes with oxygen-free copper strands which provide really good sound transmission and works really well for distances around 100 feet without any noticeable sound degradation. We also did not notice any oxidation in the copper wiring which is good. It is also rated CL2 which makes it suitable for in-wall installations. If you are looking for a fuss-free outdoor speaker wire to install patio or deck speakers with good sound transmission, the Cable Matters 14 AWG CL2 wires are a great choice. The Pyle Marine Grade 18 AWG wires are suitable for outdoor speaker applications where there is a risk of exposure to water. The cables are designed to be very convenient to use indoors or outdoors with its marine grade exterior and is waterproof, which makes it good for poolside speakers or in areas where there tends to be water. These wires have a thickness of 18 gauge which makes them suitable for speaker applications around 50 feet away from the audio amplifier with medium-powered speakers. The thickness of the wire is enough for less electrical resistance without the risk of overheating, although we would definitely recommend a 12-14 AWG speaker wire if you intend to use the wires for more high-end outdoor speaker setups. The wires come with a thick plastic jacket covering the speaker wire to protect the inner wire strands and improve insulation from voltage shocks. It also has a white mark outlined on one side of the cable wire to enable you to distinguish between the polarity markings for easy installation. The Pyle outdoor speaker wires are best suited for medium to low-powered outdoor speakers due to its 18 AWG design, and for distances no more than up to 50 feet or the sound transmission signal may be affected. For more powerful outdoor speakers, we would recommend at least a 12 – 14 AWG wire in our recommendations above. 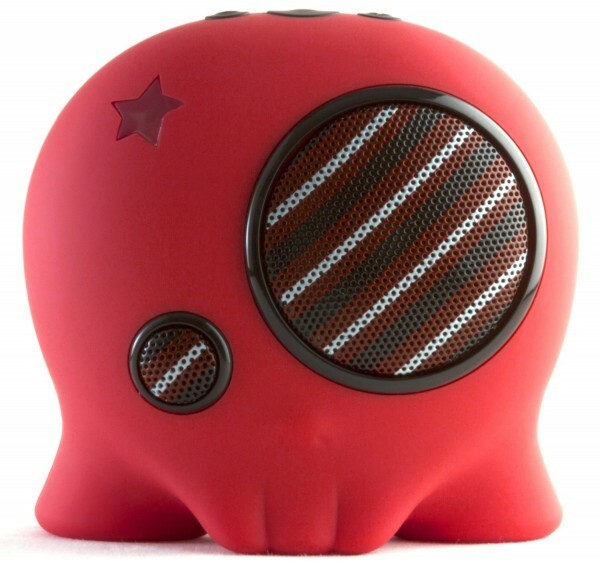 The speakers are marine grade and come with a waterproof cover jacket that protects the inner wire from oxidation or exposure to water – this makes it suitable for speakers by the poolside. We also liked the fact that the wires are polarity marked for easy installation. The wires are only 18 gauge and are easy to cut and install with banana plugs or spades, and has a nice blue white marine grade insulation jacket. The Verdict? The Pyle Marine Grade 18 AWG outdoor speaker wires are suitable for medium to low-powered outdoor speaker applications by the pool or patio area. The wires are 18 AWG which makes to suitable for distances up to 50 feet away from the audio amplifier – the thickness is just enough for electrical flow without too much resistance – although a 12-14 AWG wire would be better for more powerful speaker applications. The Pyle wire comes with a full marine grade cable jacket that protects the wire from corrosion and damage – it is also waterproof and can be used by the poolside. 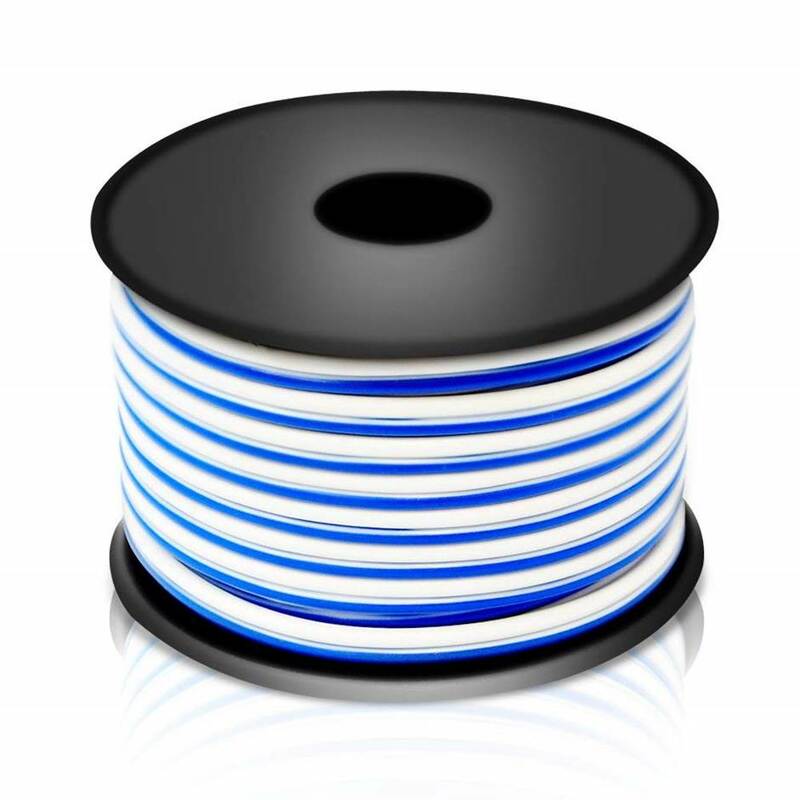 The Pyle wires come in a roll of 50 feet wires and are neatly wrapped around a hard plastic spool for easy and convenient dispensing. It also features a blue-white marine grade jacket which is easy to cut and install without damaging the inner copper wires. Overall, these are really good outdoor speaker wires to have for smaller setups and are worth checking out.